Ours is a reputed entity prominently indulge in supplying and trading quality tested Transmitter & Receiver. The offered products are specifically designed by the experts with the usage of ultramodern technology and high grade factor components. Owing to the salient features like low power consumption, easy operations, ability to withstand high temperatures and pressure and longer service life. These transmitters & receiver are highly in conformance with the set industrial standards and can be availed in required specifications. Our offered Transmitter module is precisely designed by the saw resonator by using modular technology. 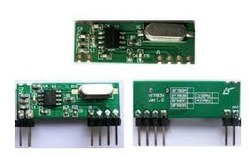 Our offered Receiver module is specifically designed with PLL synthesizer and crystal oscillator. This cost effective and reliable module comes with a he circuit shape of PLL. 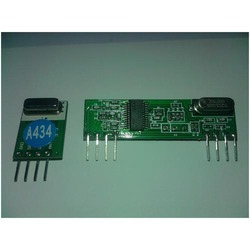 RFM83C series is a low cost, high performance ASK/OOK receiver module with operating at 315/433.92MHz.It is Customizable for special operation frequency. It features high reliability, low power consumption, high sensitivity, high performance. It provides one additional; a shutdown pin, which may be used the device off for duty-cycled operation. It is your ideal choice for designing wireless data transmission products which can be widely used on wireless data transmission field.